The 221.46ft /67.5m Custom motor yacht ‘Icon’ was built in 2010 by Icon Yachts and last refitted in 2014. The yacht’s interior has been designed by Studio Linse and her exterior styling is by Redman Whiteley Dixon. Icon’s interior layout sleeps up to 12 guests in 6 staterooms, including a master suite, 1 VIP stateroom, 2 double cabins, 2 twin cabins and 2 pullman beds. 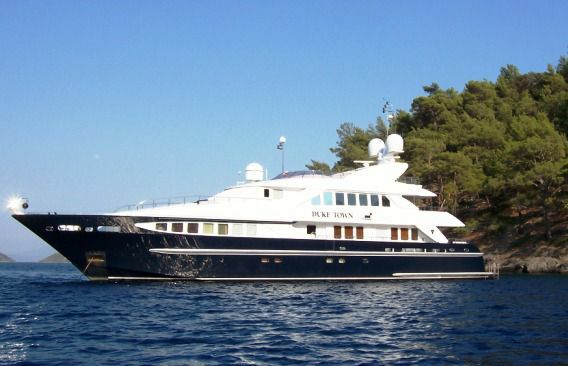 She is also capable of carrying up to 17 crew onboard to ensure a relaxed luxury yacht experience. Timeless styling, beautiful furnishings and sumptuous seating feature throughout her living areas to create an elegant and comfortable atmosphere. Icon’s impressive leisure and entertainment facilities make her the ideal charter yacht for socialising and entertaining with family and friends. Built with Steel hull and Aluminium superstructure. , she features an ultra-modern stabilization system to reduce roll motion effect and ensure the ultimate comfort throughout your charter vacation. With a cruising speed of 13 knots, a maximum speed of 16 knots and a range of 6000nm from her 193200litre fuel tanks, she is the perfect combination of performance and luxury.